Here is a little chef's dream kitchen, with room to prepare, cook, clean and create. 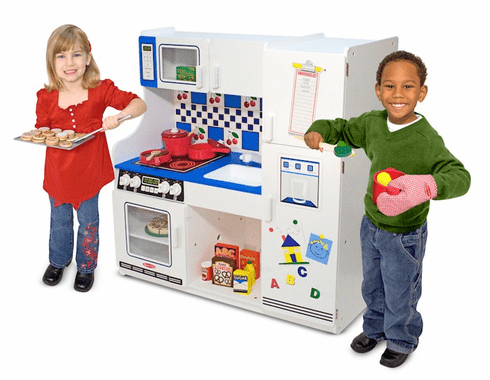 This sturdy, durable wooden kitchen includes a stove, refrigerator/freezer, oven, microwave with turntable, and sink. Bright, colorful graphics, and an exceptional price make this the most attractive kitchen! Easy to assemble, here is the one perfect place to play with your food! Dimensions: 42" x 43" x 17.5"